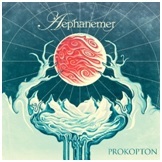 Following the release of their critically acclaimed 2016 debut album ‘Memento Mori’, 2019 finally sees the return of French melodic death metal band Aephanemer with their second album ‘Prokopton’. ‘Prokopton’ follows perfectly in the footsteps of the bands debut album, yet with a band of this nature, Aephanemer show a clear progression within their music where they take the ideas placed down on their debut album and expand on them to make an album of high quality melodic death metal which really stands out amongst their peers. One of the strongest elements that Aephanemer have to offer with their latest album is the song writing and craftsmanship that is evolving at a rapid pace, tracks such as ‘The Sovereign’ and ‘At Eternity’s Gate’ keep the albums momentum going, whilst the slow-burning album closer ‘If I Should Die’ really showcases the bands melodic nature with some fantastic vocals from Marion Bascoul that would seriously appeal to fans of Arch Enemy and Dark Tranquillity. Furthermore, unlike a lot of melodic death metal which can be indistinguishable from one artist to the next, ‘Prokopton’ contains some beautiful orchestrations and soundscapes which provide the duality of not only filling out the sound, but also provide a subtext of classical and folk influences that would be irresistible to fans of Children of Bodom, particularly during ‘Dissonance Within’ and the albums opening title track. ‘Prokopton’ is an excellent album that deserves to be heard with its only drawback being that it will sneak out under the radar. However, Aephanemer are one of the best up and coming melodic death metal bands that are in control of their own destiny and do not bow to conformity and if any melodic death metal album deserves to be heard this year, it is certainly ‘Prokopton’.